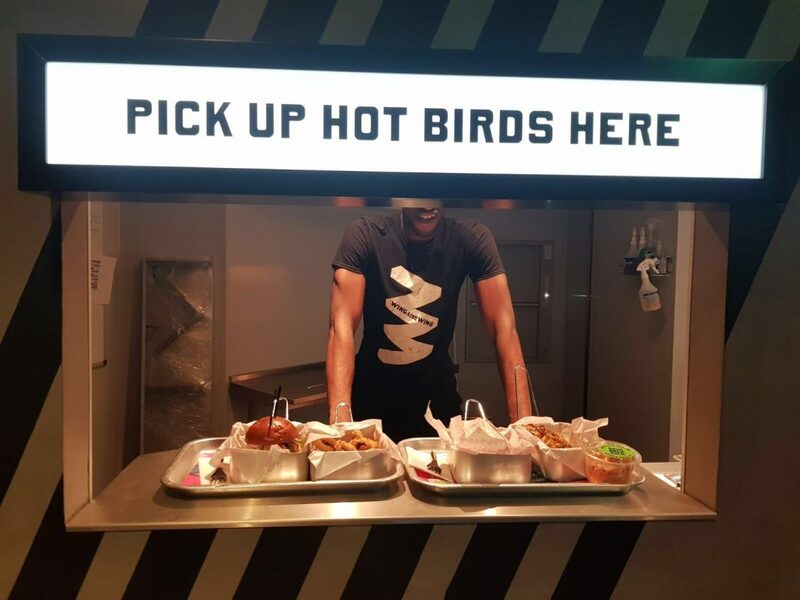 Based on the popular Korean chicken and beer joints, Wing Wing have opened their second branch of fried chicken restaurant in West London in Hammersmith, but do not be fooled, this is no ordinary chicken shop! 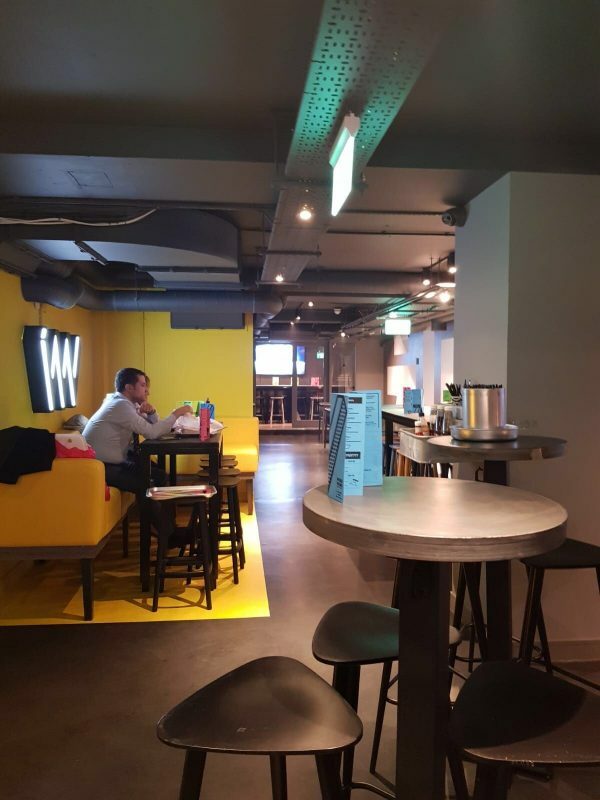 Wing Wing’s latest restaurant in West London boasts self-pouring pints, a tiny disco complete with light up dancefloor, fully kitted karaoke room, the crispiest wings you have ever eaten and the coldest beer. We had to go and check it out. Wing Wing has a choice of beers from Korean favourites to London craft beer. We ordered a pint of Singha and tried the self-pouring bar in action – click your glass into place and watch your pint magically appear from the bottom up! Sufficiently impressed, we also ordered a lemon & lime ginger beer slush (vanilla ice cream float and coconut soy flavours also available) which was sweet, fiery and fresh all at once and gets a serious thumbs up. 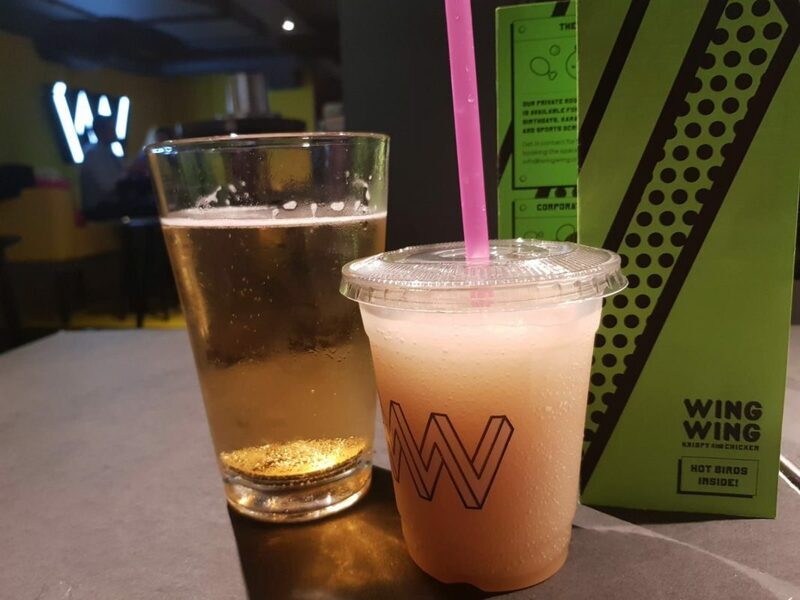 Wing Wing have a range of main dishes on offer from their famous crispy wings and drumsticks, there are also salads, wraps, burgers, bao, curry & rice boxes and crispy seafood. 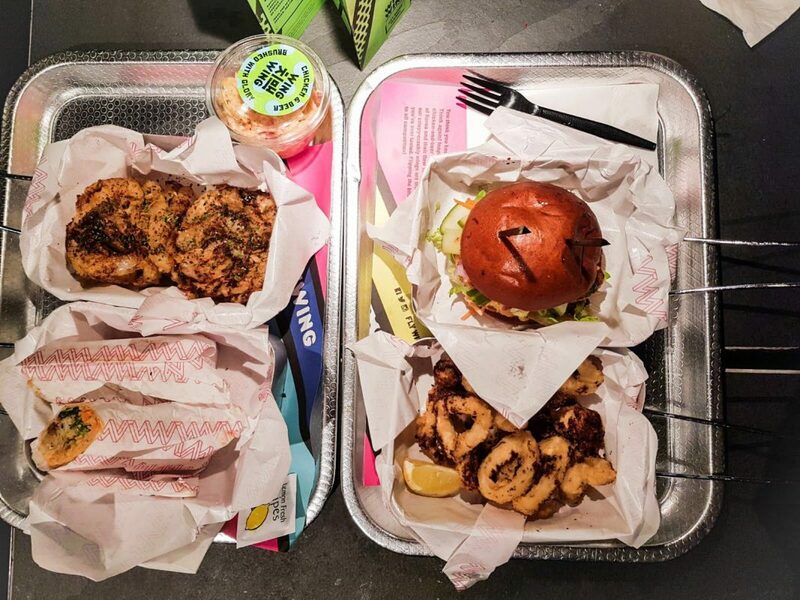 We tried the fish & chip wrap, halloumi burger (both at £7.80 each) and battered prawns and calamari (£7.90). 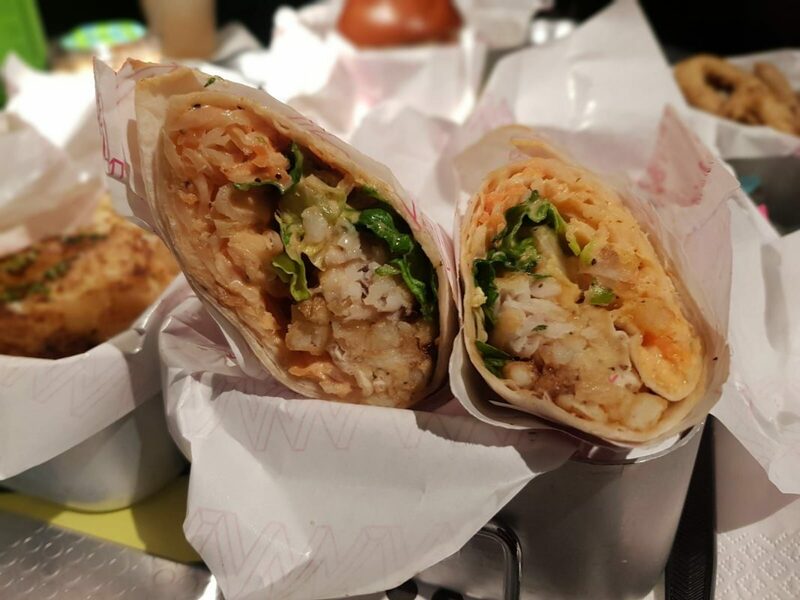 The wrap was a soft tortilla style wrap stuffed with breaded fish, chips and coleslaw. The halloumi burger was meaty and filling – veggies you won’t miss out here – with salad and coleslaw for extra bite. Our favourite by far was the battered calamari & prawns dish – we chose a soy and garlic glaze (alternatives – hot or liquorice) and the result was a tasty, crispy batter and the juiciest prawns I have had in a while! Dunk into the sticky Korean BBQ sauces on the tables for maximum punch. Kimchi coleslaw (£3) had a mild kimchi flavour and was a good accompaniment to the heavier mains. 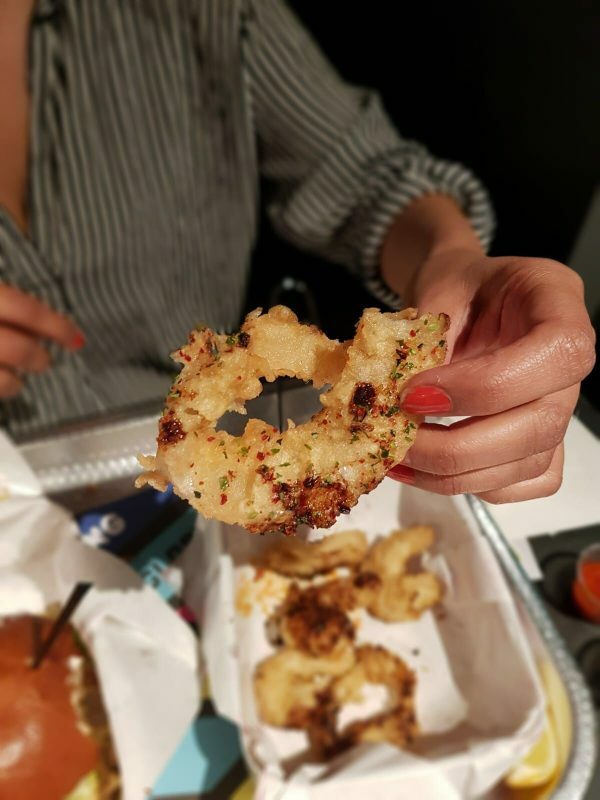 We were recommended the onion brick (£3); battered onion rings layered and topped with herbs and dried chilli, perfect for pulling apart and eating with your hands. There was a sweet garlicky flavour and Wing Wing’s signature crispiness in every bite – we would recommend ordering this! 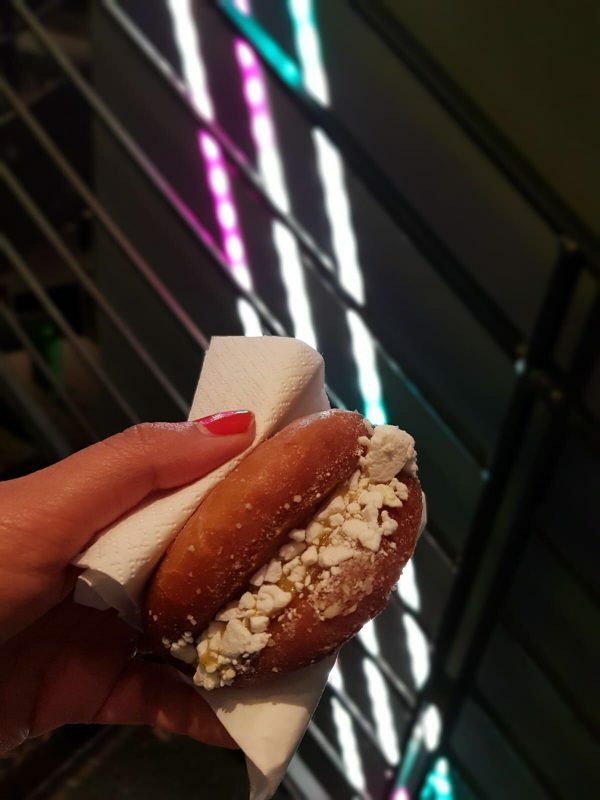 We tried Wing Wing’s take on the donut – the bao nut (£2.50) – fried bao buns with various fillings. We tried the yuzu & meringue bao nut. The yuzu filling was sweet and tangy (I would have loved a bit more!) and the chunks of meringue had a lovely crunch. They also have ice cream cones for just £1! We really enjoyed Wing Wing and left with a big smile on our faces thanks to the warm and friendly service, tasty, innovative food and touches of humour throughout the restaurant. It is perfect for a big celebration (party packs are conveniently on the menu), popping in with a group of mates or a fun date night – don’t forget to try the tiny disco on your visit!